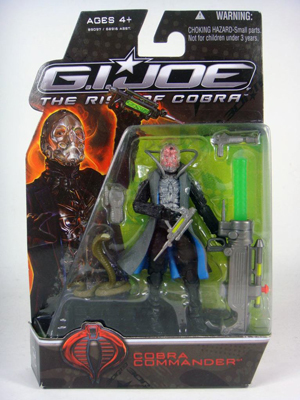 What follows is a Bill Simmons-esque discussion many of us recently had about the new Cobra Commander toy relased by Hasbro. Well, except all the frat talk is replaced with Net jargon, but this is the Basement after all. Sam: They’ve raped my childhood. Me: So, Cobra Commander wasn’t a metrosexual version of Jason X in your childhood? Sam: I will shoot you with ten guns. Derek: You know it’s Joseph Gordon-Levitt, right? From Brick, and 3rd Rock from the Sun? Me: My bad. So, Cobra Commander wasn’t a short metrosexual version of Jason X in your childhood? Sam: I want to murder the world. Yep, and we’re all married or in long-term relationships. There’s hope for all of you. All of you. Post a comment — Trackback URI RSS 2.0 feed for these comments This entry (permalink) was posted on Saturday, April 18, 2009, at 11:52 pm by Michael Trice. Filed in General.